Metro officials next week are set to spend at least $11.2 million on buses for bus rapid transit service along Post Oak, committing the agency to spending on the controversial project after years of discussion. Metropolitan Transit Authority board members discussed the purchase, and an agreement with the Uptown Management District which is rebuilding Post Oak, Wednesday. The full board meets on Feb. 20, and at that time could approve both the purchase of 14 buses and the agreement. Many details of the bus purchase and agreement with Uptown will be worked out in the coming week, after a discussion among board members at the capital and strategic planning committee. Despite the loose ends, Metro Chairwoman Carrin Patman said she expected the board to approve the requests, so the agency will be ready for the rapid transit service by May 2019. That is around when Uptown officials expect to be ready, but about a year before the Texas Department of Transportation is set to open a bus-only system along Loop 610 that will speed transit times to the Northwest Transit Center north of Interstate 10. See here for the most recent update in this process. Not mentioned in the story, but definitely a consideration, is that the Uptown BRT line would almost certainly connect to the high speed rail station, if not immediately then at some point between the line’s debut in 2019 and the Texas Central opening in 2024. I mean, it wouldn’t make any sense for them to not be connected. I’m sure this will be a part of the Metro referendum later this year as well. We’ll keep an eye on this going forward. I suppose we should have expected something like this. The city’s Uptown Development Authority and the economic development zone that feeds it were created in violation of the Texas Constitution, two critics allege in a lawsuit that seeks to void all resulting actions and block Uptown from collecting or spending another dime. The Galleria-area agency’s controversial, $200 million effort to widen Post Oak Boulevard and add dedicated bus lanes down the middle is a key focus of the lawsuit. It was filed Wednesday on behalf of restaurateur Russell Masraff and condominium resident Jim Scarborough, who was also was a plaintiff in another, since-dismissed lawsuit seeking to block the bus plan. The suit argues that Uptown officials repeatedly violated the Texas Open Meetings Act in pricing and purchasing land to widen Post Oak – including tracts in which some Uptown board members had a financial interest – and that the agency’s subsequent decisions should be voided or reversed, to the extent possible. The plaintiffs’ attorney, Joe Larsen, said he views the filing as having broader significance beyond the bus plan. This is not the first lawsuit related to this project; that one was subsequently dismissed, though without a comment on its merits. In this case, the plaintiffs asked the judge for an injunction blocking the Uptown Development Authority from spending money or issuing bonds while the litigation was in progress, but that request was denied. I feel like it’s also in the Constitution that we cannot have a non-freeway expansion transportation project in this town without at least one lawsuit. I’m not qualified to assess the legal argument being made here, so instead let me bring you a video of “Uptown Funk”, since that song has been lodged in my brain since this story first broke. With all due respect to “Uptown Girl”, I say this song should be played at the beginning of all court hearings in this case. Who’s with me on this? Swamplot has more. A woman’s jaw dropped, as though what Docefino said was inconceivable. But pretty soon, it will happen. One of the most congested roads in Houston will soon be ripped up by construction for two-and-a-half years — brought down to just two lanes, plus a left turn lane where necessary — as Uptown Houston makes ground on a public transit project that residents have been protesting for a year: the Post Oak Boulevard dedicated bus lanes project. Uptown Houston, the neighborhood management district, claims the biggest problem facing the overcrowded Uptown area is the “lack of effective commuter transit service.” To solve that problem, the district has decided to rip out the center median and replace it with two elevated bus lanes — similar to how the rail works in the center of Main Street. The buses will come every six minutes, running from the Northwest Transit Center along 610 and Post Oak to a new Bellaire Uptown Transit Center at Westpark and U.S. 59. While Uptown Houston will pay for construction and development, Metro has agreed to team up and provide the transportation once the project is complete. On Monday, though, Uptown residents held a press conference along Post Oak as part of a last-ditch effort to ask Mayor Sylvester Turner to halt the $192 million project. Among many things, residents claim this project is going to make traffic worse, will put stores along Post Oak out of business because drivers won’t want to bother with the headache, and that the project is “stained ethically” because of conflicts of interest within Uptown Houston. John Breeding, president of Uptown Houston, denied every accusation Dolcefino and the residents made. He said that no one at Uptown Houston has made any money off these deals, and also said that “this project has been vetted more than any public project I’ve ever been associated with” in response to critics saying it hasn’t been transparent. Complaints about the Uptown line are nothing new – they go back to 2010 at least. A lawsuit was filed last year claiming that the project was in conflict with the 2003 referendum because it wasn’t light rail (! ); that lawsuit was dismissed a few months later, though there was no resolution in the dismissal. A criminal complaint was filed in April over the way land was acquired for the project; there’s been no word yet as to whether there’s anything to that or not. Campos has the text of a letter this “Save Uptown” group has sent out, which calls on Mayor Turner to stop the project and says another lawsuit is in the offing. It’s not clear to me that the Mayor could stop this if he wanted to – Council approved funding as part of the overall Uptown/Memorial TIRZ expansion, but funding for this comes from other, non-city sources as well. It’s also not clear to me why Mayor Turner would want to top this given his emphasis on rethinking transportation. My question for “Save Uptown” or any other foe of this project is this: What’s your alternative to the status quo? I mean, if you think the traffic situation in the Uptown/Galleria area is fine as things are and nothing needs to be done, then fine. Say it loud and proud. If you don’t think it’s fine, then please tell me 1) what you would do about it, 2) how you would pay for it, 3) how much disruption any of your planned upgrades would cause over the next two years, and 4) what you have been doing since, oh, 2010 or so, to bring about your vision. Maybe the Uptown BRT project isn’t the best possible idea, or maybe the cost is too high, but you can’t beat something with nothing. This plan has been in motion for a long time. What have you got that’s better than it? Swamplot and the HBJ have more. Crews are relocating trees in preparation for two years of construction, starting in July. The Uptown Dedicated Bus Lanes Project will unfold in three phases, moving from north to south and starting with the West Loop to San Felipe segment. Designed to solve the area’s crushing mobility problem, the $121.5 million boulevard project is one part of a three-prong plan to make it easier for 80,000 employees to get to work. “We’ve done about all we can with the freeway, but we need to improve how automobiles move through the area. We essentially have no commuter bus service,” said Uptown Houston District president John Breeding. The boulevard will be widened from 120 to just over 136 feet. Buses will be moved to central lanes, with landscaping and sleek shelters, replacing the current esplanades. The project preserves six auto traffic lanes and their signalized left turn lanes. The Uptown TIRZ is contributing $76.5 million and getting $45 million in federal funds for the boulevard. An additional $25 million in TxDot funds and nearly $70 million in federal funds will be spent to tie the boulevard’s buses to the Northwest Transit Center and a new Bellaire/Uptown Transit Center that will tap into the Westpark Tollway and the Southwest Freeway HOV lanes. “We’re going to have the level and quality of service that the light rail system has with all the flexibility that the bus system offers,” said Uptown Houston District president John Breeding, whose group is also working with Metro to develop a new bus prototype for the boulevard that will be a hybrid of commuter rail vehicles and current buses. Giving the buses their own roadway will reduce travel time along the boulevard by 40 percent, Breeding said. But his group also wants to create a more walkable environment for growing numbers of residents and visitors in the area. The district estimates that Uptown’s current population of more than 45,000 people will mushroom to more than 69,000 by 2040. To that end, the sidewalks are being expanded from four to 12 feet and planted with a shady canopy from two rows of new trees. Sleek light towers will also make the sidewalks more inviting at night. The boulevard’s trademark steel “ring” signage will remain, and its shiny arches will be re-engineered to accommodate the wider sidewalks. There was a symbolic groundbreaking almost exactly a year ago. I guess I hadn’t realized there hadn’t been much done since then, other than more legal thrust and parry, anyway. My opinion on this project remains the same: I think it’s a good idea, I think it’s necessary, and I think that if it provides a good service, people will use it. I’d feel better about its short term prospects if the University line hadn’t been reset to zero, but if the Uptown line can be viable and useful, then that will make the case for trying again on the University line that much stronger. In the meantime, having express bus service go into the Galleria area will help provide some level of potential Uptown Line riders, and if the high speed rail line really does get built with a terminal at the Northwest Transit Center, then that’s another way to connect in. As with pretty much every rail or rail-like project ever, if it can overcome the hurdles people keep putting in the way of its construction, I think in the end we will be happy it got built. But first we have to get there. This is the beginning of that. Breeding admits the project has one serious shortfall: No bike lanes are included. “That’s an important, emerging issue,” he said, calling access for bikes “a holy grail” that couldn’t be accommodated, given “the national mood on the widths of thoroughfares.” He said the district is developing a master plan that could encourage bike traffic on other streets in the area. That is unfortunate. I’ve been an advocate for integrating bikes into the plan for Uptown (and for transit in general), so I’m sorry to see this. I hope that master plan can find some decent alternatives that will still work well with what they’re doing. A consultant who represents property owners in the Galleria area has filed a criminal complaint with the Harris County District Attorney’s Office, alleging the Uptown Development Authority and related entities broke state open meetings and disclosure laws in relation to acquiring property for a dedicated bus lane project. The complaint, filed last week with District Attorney Devon Anderson’s office, concerns meetings held by Uptown officials to discuss right-of-way purchases along Post Oak Boulevard to make the bus project feasible. “We believe that’s a violation of the Texas Open Meetings Act and have now formally asked the district attorney to investigate,” according to a statement released this week by Dolcefino’s consulting firm. His complaint also raises questions about potential conflicts of interest among board members who own or are affiliated with companies that own real estate on Post Oak. “Our attorneys … they tell us such committee meetings don’t have to be posted,” said Breeding, president of the Uptown Houston District and administrator of the Uptown Tax Increment Reinvestment Zone and Uptown Development Authority. Long story short, this is just another skirmish in the fight between the Uptown Management District and its plans to remake Post Oak Blvd and build a BRT line, and some Uptown business interests that hate the idea and have been fighting it like a pack of crazed weasels. It’s all going to culminate in a lawsuit, unless one of the shots that the opponents have been firing manages to take the project down before a suit gets filed. I rather doubt this complaint will lead to anything, but hey, you never know. AG Ken Paxton was asked for an opinion on whether or not Metro could work with the Uptown Management District on its proposed BRT line. The opinion has been given, though it doesn’t really settle anything. In the ruling, Paxton said the issue centered on the $640 million in bonds voters approved in 2003, part of an overall rail plan for the Houston area. Metro promised voters to develop light rail along the route. Holding the agency to that vow, however, would require finding that it spent the money improperly or is developing the bus lanes in lieu of its promise to voters, Paxton’s ruling said. Critics said he decision vindicated their position that Metro cannot substitute a bus project for light rail. The question could arise again if Metro tries to issue bonds – the language of which must be approved by Paxton’s office – or if critics ask a court to intervene. A court ultimately, if asked, would have to decide whether voters received the benefits Metro promised them in 2003 and that money was used for those purposes, Paxton’s opinion said. See here for the background, and see the story for a copy of the opinion, designated KP-0046 if you want to look at it on the OAG website. I don’t see any way this doesn’t end in a lawsuit. That’s just how we roll around here with rail projects. In the meantime, savor the irony of die-hard light rail opponents arguing that the Uptown line has to be built as light rail or else it’s illegal. How Andy Taylor keeps his head from exploding is one of life’s enduring mysteries. It’s a thing that is happening. Home to the city’s glittering epicenter of retail, with a dramatic skyline dominated by the towering Williams Tower and other office buildings, Uptown Houston is best known for the places where people work and play. Increasingly, it’s a place where people want to live as well. But residential is on the rise. O’Brien’s complex recently opened at 1900 Yorktown, the eight-story building advertising units with built-in wine cellars, oak floors and a large “Vegas-style” pool. The regional housing market, long dominated by spacious single-family homes in suburban areas, is evolving as buyers increasingly are attracted to urban locales where it’s possible to walk to nearby attractions, said Jacob Sudhoff of Sudhoff Properties, a high-end real estate brokerage firm specializing in condo sales. I think it’s a good thing that formerly non-residential areas such as Uptown now feature actual residences. The best way to avoid and reduce traffic is for people to be places where they don’t need to get into a car to go about their business. This is why things like sidewalks, bike paths, and transit matter. Some number of people who work and shop in the Uptown area have no choice but to drive there. If the people who do live there or live close to there can do those things by walking, biking, or taking Metro – and if there are more of those people to begin with – then they’re not competing with the folks who have to drive for space on the Loop. (I’ve made the same argument about parking for bikes at restaurants.) Doesn’t that make sense? Now if we could figure out how to get some more affordable housing into and around places like Uptown, then we’d really have something. I’m sure the next Mayor will get right on that. We haven’t heard the last of this, of that you can be certain. A judge has dismissed a lawsuit challenging a dedicated bus lane project in Houston’s Uptown area, but the ruling is not a final resolution of the dispute. State District Judge Brent Gamble on Thursday dismissed the lawsuit filed by Cosmopolitan Condominium Owners Association against the Metropolitan Transit Authority. The dismissal did not specify why the lawsuit should not go forward, although Gamble indicated previously that unresolved questions made the lawsuit premature. Both sides, however, said they viewed the dismissal as a step in their favor. “It is my hope that now people will come together to make this the best project it can be,” said Metro chairman Gilbert Garcia. Jim Scarborough, a Cosmopolitan resident and leader of the opposition to the bus lanes, said critics would have preferred that the judge halt the project. However, he said, the dismissal paves the way for Texas Attorney General Ken Paxton’s office to determine if another challenge is valid. Because Metro’s 2003 referendum authorized the transit agency to build light rail rather than buses along Post Oak, opponents have challenged the use of Metro funds for the project. Paxton’s office was asked by State Senate Transportation Committee Chairman Robert Nichols, R-Jacksonville, to determine if the project violates what voters approved. The dismissal by Judge Gamble received the case after another judge recused herself because of contact with a Metro lobbyist, is unlikely to end the opposition. Because Metro’s 2003 referendum called for light rail rather than buses along Post Oak, opponents have challenged the use of Metro funds for the project. That question has been posed to Attorney General Ken Paxton, who has not issued an opinion yet on the matter. See here and here for the background. Judge Gamble received the case after another judge recused herself because of contact with a Metro lobbyist, which just adds a touch of absurdity to the whole thing. The irony of using the ballot language from 2003 to force the construction of light rail is not lost on me. Does Rep. Culberson know about this? I can’t figure out if this tactic makes the people behind this more clever than I might have thought, or just less subtle. I mean, we have all noticed that Metro isn’t actually paying for this construction, right? I don’t know why the 2003 referendum would even apply here, but then I’m not a super-genius like Andy Taylor, so what do I know? We’ll get that AG ruling in a few months, and one way or the other I expect we’ll wind up back in court. According to the story, the Uptown Management District hopes to have a contractor named by February; utility work along Post Oak began earlier this year and technical design of the bus lanes is expected within 60 days. Time is getting short to stop this. All things considered, I suppose this was inevitable. A homeowner’s association is suing Metro over its involvement in plans to run bus lanes along Post Oak Boulevard, saying the project puts the agency at odds with a 2003 referendum that included adding a rail line along the corridor. The lawsuit was filed Monday just minutes after Mayor Annise Parker and the Uptown management district cheered the start of the $192 million project, lauding it as an example of Houston’s transit future. The plan calls for adding two dedicated bus lanes – one in each direction – along the center of Post Oak. Special lanes also would be added along Loop 610 between a future Bellaire Transit Center and the Northwest Transit Center near Interstate 10. “It’s about taking our signature retail boulevard and making it something that’s not a traffic-choked freeway,” Parker said. “The time is now,” Metro Chairman Gilbert Garcia said. A block away, opponents called the project illegal, saying Metro has no authority to participate when voters in 2003 approved light rail for the Post Oak corridor. As part of the lawsuit, Sen. Robert Nichols, R-Jacksonville, has requested an opinion from the Texas Attorney General’s office as to the legality of Metro’s involvement. Nichols chairs the senate’s transportation committee. See here for some background. Rule #1 of politics around here: If Andy Taylor is on your side, you’re on the wrong side. (*) And much more often than not, the side that’s gonna lose. Metro submitted a similar inquiry to then-Texas Attorney General Greg Abbott last year at the request of the Texas Department of Transportation. The state agency was wary of offering funds for the elevated lanes along Loop 610 if it meant jumping into a lengthy, bitter debate surrounding light rail in the area. So at TxDOT’s request, Metro sought to clarify whether an agreement with the state agency, which specified the bus project “will not support a rail component,” put Metro in conflict with its 2003 referendum. To be clear, Metro would be operating the buses, not funding the construction of the actual lanes. The project pulls heavily on Uptown tax increment reinvestment zone funds and some U.S. Department of Transportation grant money. The agency told the Attorney General’s office it no longer needed an opinion when TxDOT said its concerns had been eased and the agreement was not necessary. That was in part because federal lawmakers approved a fiscal 2015 spending plan, including language inserted by Rep. John Culberson, R-Houston, that forbid any federal money from going to rail projects along Post Oak north of Richmond, and Richmond west of Shepherd. In the lawsuit, Taylor said that voters have consented only to light rail along the corridor and that any work specific to bus rapid transit should wait until the Texas Attorney General’s office issues a response to Nichols’ request. Taylor is representing the Cosmopolitan Condominium Association, which sits along Post Oak, and Jim Scarborough, a vocal opponent of the project and property owner in the area. Scarborough has led opponents, largely business owners, who say the bus plan will disrupt the flow of traffic on Post Oak and discourage drivers from wanting to traverse the bustling corridor. At town hall meetings and news conferences, they’ve also said that the plan is a real estate deal disguised as a transit project that benefits some Uptown board members whose companies are in the right of way. Some of those companies will receive payments for their land from the TIRZ in order to widen Post Oak. Taylor dismissed any notion that the lawsuit amounted to a last-ditch effort to thwart the project rather than a substantive suit. “Metro should immediately announce its abandonment of the project, admit that it violates Metro’s contract with the voters, and, should it desire to pursue light rail, then, in accordance with its recent agreement with Congressman John Culberson, go back to the electorate with a new referendum on whether light rail should be approved on Post Oak Boulevard,” Taylor said in the lawsuit. A “last-ditch effort to thwart the project rather than a substantive suit” is pretty much how I’d describe it. There’s nobody involved with that lawsuit that actually wants a light rail line to be built, they just want to force Metro into a no-win position. I am hopeful that a judge will give this litigation the lack of respect it deserves. (*) Case in point. Those were dark, dark days. I’m really rooting for this to succeed. Dignitaries will gather Monday to symbolically start construction of wider sidewalks and dedicated bus lanes meant to enhance Post Oak Boulevard and offer improved transit service, even as some residents and business owners continue fighting to block a project they consider a huge mistake. Though it has passed a number of government hurdles, the $192 million project has faced increasingly stiff headwinds as opponents question the decision-making process as well as the data justifying the bus lanes. Plans call for adding two dedicated bus lanes – one in each direction – along the center of Post Oak. Riders would board and exit the buses at stations, similar to how light rail operates. Special lanes also would be added along Loop 610 between a future Bellaire Transit Center and the Northwest Transit Center near Interstate 10. Post Oak would be widened, without reducing the current number of general use lanes. The project is led by Uptown Houston, the management district for the Post Oak area. The Metropolitan Transit Authority would operate the bus service. Funding comes from local, state and federal sources, and the project has been approved by Uptown Houston’s board, the Houston City Council, the Houston-Galveston Area Council and Texas Department of Transportation. It has faced some political hurdles, despite broad agreement that peak-hour traffic congestion on Post Oak was hindering the area’s ability to further develop. Supporters said transit was the logical next step, noting that in most other U.S. metro areas, Uptown’s job and business scene would make it the urban core and a transit hub. Its employment numbers are on par with downtown Denver’s. See here, here, and here for some background. There’s now a dispute over projected ridership numbers, which are being recalculated by Metro as a result. I have no idea what ridership numbers will be, but I see no reason to be pessimistic. People will use it if it provides a worthwhile service. It may take some time to build, and it will definitely help if the Universities line ever gets built and gets connected to it, but if I worked in the traffic congestion hellhole that is the Uptown/Galleria area, I’d sure be interested in an alternative to driving. We’ll see how it goes. Here’s their website; if you scroll down to the bottom, you’ll see the name Daphne Scarbrough, one of the fanatical anti-rail on Richmond types who has long since morphed into an all-purpose rail hater. Given the Metro/Culberson peace treaty, the timing of their launch – the Facebook page was created Friday the 15th – isn’t exactly sublime for them. Remember that Metro has nothing to do with the construction of this line – it’s entirely being done by the Uptown Management District. Metro will eventually operate the buses, but that’s it. As far as what they’re fighting for, I can’t honestly say I’ve ever heard anyone call Uptown a “masterpiece” – hell, twenty years ago I’d have said I’d never heard the term “Uptown” used in conjunction with that part of the city. It’s not like there’s a historic preservation angle in play. My personal description of Uptown is a mess that I try to avoid at all times. I believe this plan will help, and I have no idea what alternative to help alleviate the awful traffic Save Uptown or any other group might have. Doing nothing isn’t an option, it’s just sticking your head in the cement. But here they are, and one should know one’s opponents. We’ll see if they get any traction. KHOU has more. What kind of Memorial Park do you want? Council is set to vote on the Memorial Park Conservancy plan, whether you like it or not. Joe Turner does not want more drawings gathering dust on a shelf. Houston’s parks and recreation director inherited more than a few unrealized master plans when he was hired 10 years ago. Now he’s shepherding the most complex one yet, a detailed plan to restore, improve and maintain Memorial Park, the largest and most heavily used green space in the city. Thomas Woltz describes his blueprint as a once-in-a-lifetime opportunity to help save a green space three times bigger than New York’s Central Park. It doesn’t lack for ambition, restoring the ecosystem, shifting several ballfields to the park’s northeast corner, increasing parking spaces by 30 percent and creating two dramatic land bridges spanning Memorial Drive that reconnects the park’s major sections. “We feel like we’ve enlarged the park without any land acquisition,” said Woltz, a partner in one of the nation’s premier landscape architecture firms, Nelson Byrd Woltz. But it’s an election year, and vested interests around the park are taking aim at new ideas they don’t like. Tuesday is the last day for public comment on the plan. Then, on Wednesday Mayor Annise Parker and City Council will be asked to vote on the plan, 18 months after they unanimously approved its creation. The plan was created through a partnership of Turner’s department, the Memorial Park Conservancy and the Uptown Houston tax increment reinvestment zone, which committed $3.2 million in financing for the plan. In addition to the land bridges, the plan’s most ambitious ideas involve infrastructure, including fire suppression and irrigation systems, stormwater management and a 30 percent increase in parking spaces. Those projects would happen first. They fall within the realm of the TIRZ, which by law can support infrastructure only with the tax money it collects. In interviews with the Houston Chronicle, Woltz and Sarah Newbery, Uptown’s park project manager, have said the tab might be $300 million, but last week they were loath to use any figures. Newbery said the plan simply tries to define goals for what the park should become over time, if and when funding become available to build the things it proposes. If council approves the plan, the team soon will address where and how to begin, calculate costs and put every item through “a measured and thoughtful public process,” she said. See here and here for some background on the plan; see here, here, and here for background on the TITZ part. The plan has its share of controversy, from the land bridge to the parking plan to the bayou erosion remediation. This Hair Balls post about yesterday’s Council public session covers a lot of the concerns. I’m generally favorable, though I share a lot of the concerns about the bayou. Be that as it may – you know what’s coming, right? – there’s nothing in this story to indicate what any of the Mayoral candidates think about this. Memorial Park is a crown jewel, and this is a huge undertaking that will happen on the next Mayor’s watch. Wouldn’t it be nice to know if they approve or disapprove, and what their concerns are? Here’s one guy who doesn’t like the idea. Ridership models developed by the Uptown TIRZ board project that the new bus route will carry 10,000 riders per day in 2018. This estimate is outrageously inflated, given that the more than 30-year-old Park & Ride system only carries 16,000 riders per day, most of whom are downtown-bound. This has been tried before. Since 1985, Metro has rolled out seven Park & Ride routes to the Galleria. Last month, they cancelled the sixth route (Kingsland to NW Transit to Uptown) due to low ridership. The sole surviving Park & Ride route to the Galleria (Kuykendahl to Greenway to Uptown) is classified as “poor-performing,” carrying an average of only 220 people per day to both districts. Parking in the Galleria is convenient, readily available and reasonably affordable. This is the complete opposite of the downtown area. Even in the parking-challenged downtown, over the past five years, Park & Ride participation rates are falling, from 38 percent to 28 percent. Metro’s entire Park & Ride system consists of 29 lots. Despite a 30 year-plus operating history, 23 of its 29 lots operate at 55 percent or less of capacity. What will this Guide Way project do to Post Oak, Houston’s Rodeo Drive? I believe it will ruin it. Look what happened to the merchants on Main Street. Look what’s happened to the Central Business District regarding crosstown traffic. Uptown, Metro and the city are talking about condemnation proceedings taking place before a final plan has been produced. This is par for the course. Another example of Metro’s “Ready. Fire. Aim.” approach: Recently, a long-known environmental hazard interrupted construction of the Harrisburg Line of light rail. Believe it or not, the meandering East Side Metro trains don’t run the full length of the Harrisburg route. When did the poor planning method become an accepted standard? The piece is such a mishmash of unsourced assertions, tangents, and failure to address items that have already been raised during the process that it’s hard to know where to begin. The main thing to me is that nowhere does the author suggest any alternatives to the BRT line as a way of dealing with Uptown’s crushing traffic congestion. I came away with the impression that his preference is to do nothing because there is no problem to be solved. I don’t even know how to respond to that, so let me just state a few basic principles. Traffic is bad. It’s a problem now, and it will limit future growth and economic opportunities. Building more road capacity, especially non-highway road capacity, is not an option to alleviate the mobility issues we have now or the ones we will continue to have if we do nothing. The best way to create more capacity is to create options for people who could get where they need to go without using their car. This means mass transit, bike trails and lanes, better and safer sidewalks, and the like. Not everyone will use these things, maybe not even a majority of people. But many people will use at least one of these options at least some of the time, and every time they do it means less traffic for those who can’t or won’t do anything other than drive. Maybe this plan isn’t the best of all possible plans. I’m sure there are ways it could feasibly be better, and I have no doubt there will be implementation and operation problems to deal with. But it is a workable plan that addresses the main issue, that there isn’t enough room for all the cars that want to be in Uptown now, let alone the ones that will want to be there in the future. If you want to argue against it, I’d appreciate it if you came up with your own workable alternative to it. Dedicated bus lanes along Loop 610 remain a part of planned transit service in the Uptown area after state officials kept $25 million allocated to an upcoming project. After months of discussions about the project’s purpose and agreements between the Metropolitan Transit Authority and the Texas Department of Transportation, state transportation commissioners Thursday approved the state’s 10-year spending plan with the money for the bus lanes included. John Breeding, president of the Uptown Management District, told officials he was pleased to move the process along. “We particularly thank you for your leadership and your patience as the area got its act together on this project,” Breeding said. Proponents of the project have noted Uptown is one of Houston’s most traffic-clogged areas, a problem that’s likely to worsen with recent development. More frequent, fast and predictable transit, supporters say, could give many workers an option that would take cars off the roads and out of Uptown parking garages. State transportation officials passed the plan without comment. The plan is updated annually and covers the next decade of road expansion and maintenance as well as transit and alternative transportation projects, such as bicycle lanes. “The way this project will be successful is to make it reliable and fast,” Metro board chairman Gilbert Garcia said. Post Oak will continue to have three traffic lanes in each direction, with some turn lanes. Some traffic lights will be sequenced to allow buses to avoid stopping but not those at major intersections such as Westheimer and San Felipe, where tweaking the timing could have disastrous effects on traffic flow. See here for the previous update. There was far too much squabbling over this, and I’m still unhappy with the condition that there be no preparations included for possible future conversion to light rail, but at least this hurdle has been cleared. Metro Chair Garcia is right that the main goal here is to build something that people will want to use. If that happens, it will be a lot easier to take a next step if there is one. Always susceptible to gridlock, especially at Christmastime, the traffic jams now happen year-round and last longer each day. Clearly, Uptown badly needs convenient, reliable alternatives to cars for the tens of thousands of workers and residents who live, work and shop in the area, the largest business district in the nation outside of a traditional downtown. One such alternative is bicycling. Houston has made impressive progress in recent years to make bicycling safer and more convenient. The Bayou Greenways Initiative, Safe Passing Law and Complete Streets policy are recent examples, and an updated Bikeway Master Plan, now underway, will identify additional on- and off-street facilities to fill in the gaps in Houston’s bikeway network. Uptown, however, remains dangerous to navigate by bike, especially during rush hour. Surrounded on three sides by major freeways, there are few safe options to enter the area by bike. Once there, a cyclist must navigate streets designed solely to move cars as quickly as possible, with few accommodations for cyclists. Post Oak Boulevard, Uptown’s signature street, is an obvious example. While biking there can be a death-defying experience, even walking is a daunting and frightening prospect, with sidewalks located right next to speeding traffic. The proposed Uptown dedicated bus lanes project (“Bus project along Post Oak appears ready to roll ahead” Page B3, Jan. 29) will provide one alternative to driving, especially for commuters in the suburbs who have access to park and ride routes that run to the existing Northwest and proposed Bellaire/Uptown transit centers. The project features a total rebuild of Post Oak Boulevard to add dedicated bus lanes in the middle, while preserving existing lanes for cars. Adding dedicated bike lanes to the dedicated bus lane project would provide an additional alternative to those who want access to shops, workplaces and restaurants along Post Oak, as well as provide connectivity to adjoining neighborhoods, Memorial Park and the Greater Houston bikeway network. Bike lanes would also enhance the pedestrian realm by providing a buffer between sidewalks and automobile traffic. I agree completely. It doesn’t make sense to spend all that money redoing Post Oak Lane and not end up with a street that is more bike and pedestrian friendly. There are two ways to deal with excessive traffic in destinations like Uptown: Make it easier to get there without driving, primarily for commuters, and make it easier for those who are already there to get around within the area without driving. Downtown does both of those things. Uptown is working on the first one, with the BRT line and the HOV lane. It really needs to do the other, and the opportunity to do that begins with the BRT line construction on Post Oak. I want to be clear that this is the Uptown Management District’s responsibility. Metro will operate the BRT line once it is built, but the Management District is doing the design and construction. Please do it right the first time, y’all. Metro’s board gave unanimous, final approval to the so-called reimagining plan, authorizing agency staff to plan public meetings to explain the changes. Between now and August, Metro must replace every sign at every bus stop, revise every bus schedule and prepare a massive educational campaign. “This will be the biggest outreach effort in the history of the city,” Metro board chairman Gilbert Garcia said. Metro plans to spend around $7.5 million replacing signs at bus stops, reprinting maps and schedules and conducting the educational campaign. The need for these steps led to a two-month delay on starting the new routes, which had been scheduled for June. “The day this goes into effect, I intend to be standing at a bus stop helping people out,” [board member Christof] Spieler said. See here for the previous update. Metro has a lot riding on this. I believe the concept is sound, but the execution is key. I will be very eager to see what the effect is on ridership. Meanwhile, according to this Chron editorial that ran on Wednesday, the board was also supposed to vote on approving funds for the Uptown BRT line. I don’t know what happened with that, but unlike bus system reimagining, for which the Chron had good things to say, they had concerns about this project. Both Metro and Uptown organizations have made grand claims about how this BRT plan will reduce congestion on West 610 Loop, but we’ve yet to see supporting numbers or studies. It is also troubling that a total reconstruction of Post Oak doesn’t include bicycle lanes. The people who live and work in the Uptown area should be able to use bikes as transportation without risking their lives. Multi-modal transit provides the most and best options for a booming Galleria area. Members of the Uptown Tax Increment Reinvestment Zone and Uptown Houston Management District, which are spearheading the project, told the Houston Chronicle editorial board that the project should be judged by its results. It is hard to judge by anything else. These appointed boards hold their meetings away from City Hall and operate without the direct input of voters, all while diverting taxpayer dollars. Meanwhile, this cost of this BRT project has grown from an originally projected $177.5 million to Uptown Houston’s current $192.5 million estimate. Metro told the editorial board that the project would cost more than $250 million. These conflicting numbers should serve as a warning sign. Mayoral elections are around the corner, and unless this BRT project has unanimous support, that big budget item risks getting diverted away from transit and toward filling potholes and hiring police officers, just as Mayor Bob Lanier did with transit funding in the early 1990s. The growing Galleria area looks to choke on its own growth as new towers go up and more cars fill crowded roads and freeways. At its core, the BRT plan tries to bring the success of park and ride into Uptown, but it needs support from all stakeholders before moving forward. I’ve discussed the subject of bikes in conjunction with this line before. I definitely agree that if the Uptown Management District is going to spend all this money and cause all this disruption to redo Post Oak like this, it makes much more sense to incorporate bikes now rather than try to shoehorn them in later, after they’ve realized what a mistake they made by not planning for them in the first place. I hope they don’t make that mistake. As for the effect of the Mayoral race on this project, you know how I feel about that. You can start talking about things other than potholes and pensions any time now, fellas. Texas Leftist has more. Tensions are easing over plans to develop dedicated bus lanes in Uptown, where community leaders want to give commuters and shoppers more transportation options and relieve worsening congestion. “We’re there and ready to make this project happen,” said John Breeding, president of the Uptown Management District, the agency leading the project to run express buses along Post Oak Boulevard and Loop 610. The buses would connect a future Bellaire Transit Center to the Metropolitan Transit Authority’s Northwest Transit Center. Breeding and others said buses should start rolling on Post Oak in mid-2017. Lately, the project has been mired in disputes between Metro and Texas Department of Transportation officials. After Metro officials balked at an agreement TxDOT requested to ensure the project was only for buses and would not be converted to rail in the future, state transportation commissioner Jeff Moseley proposed moving $25 million from Uptown to an unrelated project. The state funds would pay for elevated bus lanes along Loop 610. Moseley had said the disagreement indicated the Loop 610 project wasn’t ready to move forward. Although its absence would not kill the project, the Loop 610 component would dramatically improve the travel time to the Northwest Transit Center. Faster, more reliable service would increase use of the lanes, said Metro board member Christof Spieler. On Wednesday, Moseley said TxDOT had agreed to keep its funding for the project on the table until February, providing enough time for Metro to resolve its concerns about agreeing to a bus-only project. Voters in 2003 authorized the agency to build light rail in the corridor. Metro chairman Gilbert Garcia said he was optimistic the various players could agree on issues skeptics have raised about mass transit in the Uptown area. See here for the last update. I’m glad to see Moseley and TxDOT acting more reasonably, though I’m still annoyed that they’re dictating terms that would stand in contradiction to the 2003 Metro referendum. I suppose I can live with that if we can finally get this project off the ground. The Highwayman has more. Given powerful support from local and state transportation officials, the more of the parkway comes together, the more likely the last phases will fall into place. The project that remains far less certain is the planned dedicated bus lanes on Post Oak Boulevard. The project, which a few months ago was speeding along, has run into significant bumps as TxDOT and the Metropolitan Transit Authority have dueled over agreements related to a bus lane along Loop 610. Moseley in September warned if all parties couldn’t agree on the project, he’d prefer TxDOT move its $25 million commitment to a new Texas 288 interchange with the Sam Houston Tollway. Losing TxDOT’s money puts the Loop 610 portion of the bus lanes, and potentially the entire plan to run express bus service along Post Oak, in doubt. Metro officials have since signed the agreement, but transit board chairman Gilbert Garcia complained TxDOT officials haven’t backed off the threat to move the money. Marc Williams, director of planning for TxDOT, told transportation commissioners Thursday that the discussions are ongoing, but the recommendation at this point is to shift the money to the Texas 288 project. A final decision is expected Nov. 20 when the commission meets in Austin. Written comments about state’s unified transportation plan — which guides state transportation spending — will be accepted until Nov. 17. See here, here, and here for the background. What the hell else does TxDOT want? I have no idea why they’re being such huge jerks about this. If it’s at all feasible, I’d advise Metro and the Uptown Management District to tell TxDOT to go screw itself and finance that $25 million themselves. That way they can build it the way they want to, and they wouldn’t have to put up with this petty crap. If that’s not realistic, then I hope TxDOT gets over itself and does its job. But jeez Louise, enough already. This continues to be ridiculous. Continued disagreement about certain features of a planned Uptown bus rapid transit system prompted a Texas transportation official to suggest Thursday that $25 million in state funding should be redirected. The comments by Texas Transportation Commissioner Jeff Moseley were the latest setback for the project, intended to relieve traffic congestion in the Galleria area. After months of planning and lobbying to secure local, regional and state money, it has faced increasingly vocal opposition and a fraying of the partnership among the Uptown Management District, the Metropolitan Transit Authority and the Texas Department of Transportation. The $192.5 million project is expected to open in 2017, with some still holding out hope that portions will open in time for Houston’s hosting of the Super Bowl on Feb. 5 of that year. Metro, city officials and TxDOT have dozens of items to resolve while they try to counter criticism of the project. Topping the list of disputes is the state’s role in the project: elevated bus lanes along Loop 610 between Post Oak Boulevard and the Northwest Transit Center. A $25 million commitment from the state led state transportation officials to seek Metro’s assurance the project was strictly a bus plan, not a prescursor to rail. “We didn’t want our involvement in this project to be clouded by rail versus bus,” Moseley said. Metro chairman Gilbert Garcia said he must clarify whether signing the agreement with TxDOT, which specifies the bus project “will not support a rail component,” puts Metro at odds with its 2003 referendum, which included a rail line in the Post Oak Corridor. On Metro’s behalf, the county attorney has asked Attorney General Gregg Abbott’s office to determine whether signing the agreement would violate the will of the 2003 voters. Waiting for Abbott’s decision could take months. Moseley said the potential delay “compromises the availability of those funds” related to the elevated lanes, because state officials have many construction projects ready to go. At a meeting in Austin on Thursday, Moseley said that if the Uptown project is not ready to move forward, he will ask that the state funds shift to a project at Texas 288 and Sam Houston Tollway. I’ve already ranted about this, and I don’t have much to add to that. The potential delay here is entirely of Jeff Moseley and the TTC’s making. For the life of me, I cannot understand the justification of forbidding the inclusion of some design elements that may someday, if a bunch of things eventually happen, allow for this BRT line to be converted to light rail as the voters approved in 2003 in a cost-effective manner. The TTC has no power to forbid that from happening, and even if Metro agrees to their conditions now a future Metro board will not be bound to keep the Uptown line as BRT if they decide it’s in the public’s best interest to finally move forward with the light rail line we thought we were getting. All the TTC can do is make that future Metro board’s job harder and more expensive. Why would they want to do that? So as we know, the Uptown line is moving ahead as BRT. It will be paid for with a variety of funds, coming from the city, from an Uptown/Memorial TIRZ, from grants, and so forth. A key component of this is an HOV lane on 610 for the buses that will carry the passengers for this line. The Uptown Management District and Metro were recently given $25 million from the Texas Transportation Commission to facilitate this part of the construction. That money came with the proviso that this was really and truly going to be a BRT project, not a light rail project. Apparently, the recipients haven’t pinky-sworn hard enough on this to convince the TTC of their sincerity. State transportation officials approved adding the Loop 610 phase to the state’s transportation plan, making it eligible for $25 million from the Texas Transportation Commission. When commissioners approved the project in June, it was clear they meant it to be a bus project. “We’ve had very open discussions that there is not contemplation it will be used for rail,” state transportation commissioner Jeff Moseley said during the June 26 meeting in Baytown. State officials and skeptics of Metro’s regional light rail efforts are looking for signed assurances that the bus lane won’t be converted to rail, which Metro officials say they must carefully review. Moseley suggested Metro’s pledge on not building rail “could be stronger,” according to an email the same day. He suggested noting that any construction would not facilitate rail conversion. Metro chairman Gilbert Garcia reiterated Metro’s lack of any defined rail plans last week, but he said transit officials can’t take light rail entirely off the table because the 2003 referendum specifically lists a Post Oak corridor for future rail development. “I am being respectful of the will of the voters,” Garcia said. Uptown and state officials have signed, but Garcia said he is still mulling the significance of the agreement. Converting bus rapid transit lanes to rail requires subtle but significant changes, and the initial design of the Post Oak project could make that conversion easier or more difficult. Sharp curves where buses are capable of going might not be as easy for trains. See here for the background. I for one agree with Gilbert Garcia. The casual disregard for the 2003 referendum by light rail opponents continues to astonish me. The Uptown line was intended to be light rail. That’s what the voters approved. I’m okay with it being built as BRT for now, because we do need to do something today and because at this point it doesn’t make sense to do the more expensive investment of light rail infrastructure until we know for sure that the Universities line will be built and/or until a commuter rail line along US290 gets going. But how does it possibly make sense to cut off, or at least make much less viable, a transit option that may not be on the table for ten years or more by putting a ridiculously long-term condition on a measly $25 million grant today? It would be better to forfeit those funds now than to sign away future enhancements that may someday look like a great idea or that may never happen. What authority does the TTC have to impose such a short-sighted condition? As far as the Uptown board goes, no future Metro is going to go ahead with a light rail conversion for the Uptown BRT line without the cooperation and co-funding of the Uptown Management District. The current board has no more right to shackle its future successors than the TTC does to shackle Metro. Can we please quit with the posturing and get on with the plans already? Sheesh. Texas transportation officials Thursday kicked in $25 million to build a dedicated bus lane along Loop 610, ensuring the second piece of a planned bus rapid transit corridor in the Uptown area. As part of a larger statewide transportation spending plan for the next decade, members of the Texas Transportation Commission added $25 million to the transit plan. Officials with the Uptown Management District and Metropolitan Transit Authority are working on the bus project. The project along Loop 610 is specific for buses. “We’ve had very open discussions that there is not contemplation it will be used for rail,” state transportation commissioner Jeff Moseley said. The money is scheduled for the project in 2017. Plans call for bus-only lanes along Post Oak and Loop 610 between the future Westpark Transit Center that Metro’s building and the Northwest Transit Center near Interstate 10. “It really is a transformational project in Houston,” said Metro chairman Gilbert Garcia, noting it allows workers in the Uptown area to avoid some congested parts of their trip. See here, here, here, and here for the background. I presume the rail restriction on these funds is just for these funds, and that if someday Metro wants to build the Uptown Line as originally envisioned it can do so. That’s not even close to the radar at this time, I just hope future options are being kept open. For now, I’m glad to see this move along. HERE ARE SOME of the purty watercolor renderings the Uptown District has been presenting of what Post Oak Blvd. will look like after the addition of 2 dedicated bus lanes down its middle. The proposed changes to the thoroughfare won’t take away any of the 6 existing car lanes or 13 existing left-turn-signal lanes. There’ll be a few modifications, though: new protected-left-turn signals will be put in at West Briar Lane and Fairdale, for example, and 3 median openings will be closed. The space for the buses and 8 transit stations along the Boulevard between the West Loop and Richmond Ave will come from acquiring 8 feet of right-of-way from each side of the existing street. The bus lanes and light-rail-style stations will go in the median. Notably, the Uptown District presentations never use the phrase “Bus Rapid Transit,” or BRT in describing the upgrades, though a BRT system has been pitched as a replacement for Metro’s earlier proposal for an Uptown light-rail line. Uptown Houston got approval for a $61.8 million federal grant to fund the street reconstruction last year. It appears that the lanes will be used for commuter buses as well: “This joint project of the City of Houston and Uptown,” an executive summary of the program reads, “will develop a system designed to connect workers to Uptown via Houston’s highly successful HOV network.” The dedicated bus lanes are an additional piece of the project. The buses will still have to stop at intersections, and move through lights only when cars do. “All travel time savings for the buses will be generated by simply being the ‘first-in-line’ at the signalized intersections made possible by the dedicated bus lanes,” the summary notes. Good to see, and I think they make a decent point. We’re glad that Houston-area transportation officials have approved federal funds for an Uptown bus rapid transit (BRT) system. But we’re struck by [Harris County Judge Ed] Emmett’s vote against the plan at the Galveston-Houston Area Council Transportation Policy Council. Emmett is no knee jerk mass transit opponent. Harris County’s resident transit nerd, these sorts of issues are his bread and butter, and the Uptown Houston Management District should heed his concerns. If the BRT is going to be built for office workers, then it should meet those needs. We believe that means bus stops large enough and service often enough to accommodate rush-hour crowds; protected crosswalks and wide sidewalks that make it easy to get from buses to the office; shade and cover to make those walks comfortable. Adding B-Cycle rental stations and designated bike routes to this Uptown project could also help bridge the gap from bus stop to office door. Unlike downtown’s Park and Ride buses, stops won’t be immediately outside of office buildings and there isn’t an underground tunnel system to avoid the heat. Houston neighborhoods are rarely built with pedestrians in mind, and BRT will only live up to the full potential if this overhaul of Uptown transit addresses every inch of the commuter route – transfers and walks included. See here for the background. I am of course delighted to see the Chron get on board with the idea of using B-Cycle to enhance and extend the BRT/commuter bus network, since I’ve been advocating for that all along. I do agree that it would be wise for the Uptown Management District to take pedestrian concerns seriously. If Judge Emmett has any thoughts about how those concerns might be addressed, I’m sure we’d be glad to hear them. The bottom line remains that this is a worthwhile idea, and we should do every reasonable thing we can to make it work. The Chron had a nice lifestyle section story about B-Cycle last week. B-cycles are appearing all over downtown and Midtown. You may have seen them, parked at racks with self-serve kiosks, where riders are able to enter their payment information, detach the bike and go. B-cycle is a program of Houston Bike Share, a nonprofit organization funded by federal grants. The program started in May 2012 with 18 bikes planted at the George R. Brown Convention Center, Houston City Hall and Market Square. Success was immediate. Today 173 bikes are available at 21 stations in downtown, Midtown and Montrose, with more planned. Will Rub, the director of Houston Bike Share, is passionate about the program. “Our prices are so much better than most other cities’. Denver carries an $80 annual cost and a weekly rate of $20; New York’s annual rate is $95 while the weekly is $25. You can rent a Houston B-cycle bike for as little as $5 for 24 hours; $15 for seven days and $65 for a year,” Rub said. That means someone who wants to ride a B-cycle to work must pick up a bike in the morning and park it when he arrives at his destination. He must use another bike to ride home in the afternoon. Because the bikes are linked to computers, Rub can track who takes a bike at any given time and where he drops it off. He said several residents of the Sabine Lofts near the Sabine Street Bridge will pick up bikes about 7:30 a.m., ride for four to six minutes, then leave them at buildings downtown. The stations are open 6 a.m.-11 p.m. daily, though bikes can be returned at any time. Not a whole lot there that would be news to anyone who has been paying attention to B-Cycle. I suspect this was an introductory story for those who haven’t followed it closely – Page One of the lifestyle section will do that. I don’t have any particular analysis of it, I just wanted to note that having moved to a downtown office a couple of weeks ago, I finally got a chance to break in my own B-Cycle membership. I rode to and from Phoenician Market for lunch. That would have been a ten-minute-plus walk for me, not terribly inviting in the heat, but was much quicker and less arduous on a bike, since the nice thing about riding is that you create a breeze for yourself. My way of thinking of this is that having B-Cycle available – there’s a kiosk two blocks from my office – enables me to expand my range of lunch possibilities. I can get farther in a short time span, with my car being an impractical option (and sometimes an unavailable one, if Tiffany needs it at lunchtime). I’ve got my eye on the Food Truck Park and Stanton’s City Bites for the future. Maybe the north end of Midtown – there’s a bunch of stuff there on West Gray, just south of I-45. All practical and doable with a bike, but not by any other means. I’m getting enthusiastic thinking about it. On a related note, I had a doctor’s appointment last week. My doctor’s office is 1.3 miles from where I work, according to Google Maps. Way too far to walk, and a big hassle to drive since it means going from one multi-story parking lot to another – and having to pay for the privilege at my destination – but a snap on a bike. To avoid any concerns about securing the bike or keeping it longer than the 60-minutes-free period, I rode from one kiosk to another, which was four blocks away from the office. Given that I’d have had to walk four blocks to get my car anyway, my trip took no more time than driving would have, and it was free. You just can’t beat that. Does this fit into the Chron’s critique of B-Cycle as “toys for urban bohemians” rather than “legitimate transportation”? Well, beyond the fact that if I’m a bohemian then the term has lost all meaning, how is this not “legitimate” transportation? These destinations are all too far to walk, but are within five minutes of my B-Cycle kiosk. It’s still a car off the street, even if it’s not at rush hour, and even if the thought of driving to one of these places – after walking four blocks to my parking garage, and not having any guarantee of finding parking at some of these destinations – is ludicrous. It makes downtown a better experience for me as an employee there, and though I do have a car available to me because I carpool with my wife, B-Cycle makes taking transit to downtown more attractive, since you needn’t feel as limited for lunch options. That’s my point about the Uptown transit plan, and why I think B-Cycle expansion out there will help address Judge Emmett’s concerns about people not wanting to give up their cars. I bet if it was pitched properly, you might be able to get the Uptown Management District and/or some of the businesses there to kick in for a piece of the cost to put kiosks there. It’s good to have options, and B-Cycle provides them. Houston-area transportation officials approved a plan Friday to use $61.8 million in federal funds to help build bus-only lanes along Post Oak Boulevard in the Uptown area. The project, sponsored by the Uptown Management District, widens Post Oak to add two center lanes for buses that will shuttle riders from two Metropolitan Transit Authority transit centers into the bustling Uptown business area. The $177.5 million project is slated to start construction in 2015, said John Breeding, Uptown’s president. Breeding and other Uptown area business leaders told the Houston-Galveston Area Council’s Transportation Policy Council the project could be a game-changer in terms of how people commute into the area to work and to shop. “We are convinced it will improve mobility well beyond its neighborhood,” said Jack Drake, president of the Greenspoint District. See here and here for the background. The plan to install BRT as a (temporary?) replacement for light rail along the Uptown Line has gotten the bulk of the attention, but the addition of HOV lanes is likely the bigger deal. Somewhat strangely to me, Harris County Judge Ed Emmett, who voted No, expressed skepticism about that aspect of the plan. “I am afraid we are going to look up in 10 years and say, ‘What did we do that for?’ ” Harris County Judge Ed Emmett said. Emmett, chairman of the transportation council, said the project followed the rules and on paper warranted the funding commitment from local officials. That doesn’t mean, however, that it’s the right project to solve the Uptown area’s serious traffic problems, said Emmett, expressing doubts that Houston residents would get out of their cars to take a bus to work. “I think I know Houstonians enough to know they are going to want to drive,” Emmett said. Unlike downtown, where park-and-ride buses drop commuters off right in front of major buildings, someone leaving an office on Post Oak would have to cross wide grass medians and wait at an outdoor transit stop in the middle of the street. “When it’s 95 degrees, is anybody going to do that?” Emmett asked. You hear that “it gets hot in Houston” argument often for why non-car-oriented projects won’t be worth it. It’s true we have hot summers, but that’s only three months out of the year. The rest of the year is great weather for being outside. We’re still talking about a fairly short distance to walk to get from bus to building. I’m sorry, but I don’t see this as a good reason to oppose the plan, especially given how awful traffic around the Galleria is. I think plenty of people would be happy to have an alternative to that. One argument that I can see is that once you’ve taken a bus into Uptown, you’re stranded when you want to go to lunch. Downtown there are tons of options in easy walking distance – if you drive into downtown to work, depending on how close your garage is to your office, you can likely get to numerous lunch places in the time it would take you to walk to your car. I don’t know what the situation is like Uptown. But that’s where the rest of the plan comes in – the BRT line will help you get around Uptown, perhaps someday connecting to the University line as well. Throw in a future B-Cycle expansion as I’ve been suggesting, and I think you’ve got it mostly covered. Metro and the Uptown District will need to educate businesses and employees about what their commuting options will be in the future, but I’m sure they’ll take care of that. I think this is a good idea and I think it’s going to make a positive difference in the area. What do you think? Ed Wulfe never mentions Mattress Mack or his recent diatribe in the Chron about the proposed Uptown/Memorial Park TIRZ, but his op-ed in the Chron is clearly aimed at countering naysayers like Mattress Mack. Uptown is one of the most successful mixed-use urban environments in the United States and a leading economic driver of Houston; yet, Uptown has been historically underserved by public transportation. This is a major concern expressed by employers in the area or those considering a new location in Uptown because a functional and efficient means of mobility for their employees is critical to productivity and an ability to retain and attract workers. More than 75,000 people work at the 2,000 plus businesses in approximately 23 million square feet of offices, 5 million square feet of retail and 7,000 hotel rooms. Sixty-five percent of Uptown’s workforce currently lives in the Sugar Land, Westpark, Katy or Cypress areas, and the ability and need to connect workers to Uptown is an ongoing and increasing challenge. This plan, while primarily designed to serve the workforce of the Uptown area, also enables movement to, from and through the corridor more efficiently in both directions. The widening of Post Oak Boulevard will allow for construction of bus rapid lanes within a landscaped median while still preserving six lanes totally dedicated for automobile traffic. The plan is designed to connect with Metro’s Northwest Transit Center and the proposed Westpark Transit Center. Exclusive bus lanes will remove buses from general traffic lanes while augmenting pedestrian access. The existing traffic signal system and left turn lanes will remain as is, and Post Oak Boulevard’s signature oak trees will be preserved. The plan before City Council has evolved based on growing transit needs in and around Uptown, and discussions with the city and the Memorial Park Conservancy to ensure the restoration, preservation and improvement of Memorial Park, a major amenity and connector to downtown Houston. Two points come to mind. One is that this plan isn’t just about Uptown mobility, it’s also about reforesting Memorial Park, which abuts Uptown to the northeast. Mack never touched on this in his rant, but the two are a package deal. There may be a way to fund Memorial Park reforestration that doesn’t involve Uptown, though such a thing isn’t on the table as far as I know, and one could argue that the Uptown mobility part of this plan should be removed, but then what does Uptown get out of it? Basically, this is the plan to reforest Memorial Park. If you approve of that idea but don’t like the other parts of the plan, then you need to propose an alternative plan. What other options are there? Point two is that the same thing holds true for Uptown mobility. Mattress Mack, as is often the case with opponents of mass transit in general or to specific plans, doesn’t offer a competing vision for Uptown. The closest he comes to that is at the end of his piece when he says “More than 80 percent of our region lives and works in the suburbs, so obviously that is where we need to concentrate our efforts”, which is both a dubious statistic (he gives no citation) and beside the point – it’s not the city of Houston’s responsibility to abet mobility in the non-Houston suburbs, though plenty of our Harris County tax dollars do just that. Assuming that you agree that doing nothing is not a good option for Uptown, what would you do to improve mobility there? Remember, this isn’t just about building dedicated lanes for BRT on Post Oak, it’s about connecting Uptown to the greater Metro park and ride network, via the Northwest and Westpark transit centers. If you don’t support that, what do you support? Anyway, the plan is still in flux, as Council has not had a chance to discuss it yet. The BRT plan depends in part on grant funding from the Houston-Galveston Area Council, but that funding has not been approved and may not be guaranteed despite strong support from the Greater Houston Partnership. It’s possible this could all fall apart, in which case Mack will have ranted for nothing. I hope it doesn’t come to that, but nothing is certain until it’s done. There’s a lot missing from Jim “Mattress Mack” McIngvale’s screed in the Sunday op-ed pages. When you get right down to it, the recent announcement that the Uptown Houston Management District wants to spend $177.5 million to “redesign and widen” Post Oak Boulevard and build a Bus Rapid Transit (BRT) system through the heart of the Galleria area tells you everything you need to know. It tells you that here in the fourth-largest city in America, our Metropolitan Transit Authority is so tarnished by corruption and scandal, so riddled with $1.3 billion in debt, and generally so ineffective that they now must rely on a local taxing district to do their job. So one “rogue” organization, as Mayor Annise Parker referred to Metro back when she was running for office, is passing the baton of an incredibly expensive and very ineffective transportation program to an even less transparent organization – the Uptown District. Folks, this is not progress. It’s government at its worst. First, if the Uptown District wants Metro to provide bus service up and down Post Oak, they could do that right now without spending an additional dime. But this isn’t about buses. It’s about paving the way for light rail and helping the contractors and developers who live off city contracts and make generous campaign contributions. I wish I could quote the whole thing, because it’s a masterpiece of unfocused anger, buzzwords, and vague accusations. It could easily have been a transcript from a talk radio segment. But let’s discuss some of the things that aren’t in this piece. First, McIngvale’s antipathy to the Uptown Line goes back at least three years, when he and some other Galleria-area businesses, aided by one of the anti-rail-on-Richmond agitators, threw a fit about a design for the Uptown Line that had come to light a few months before. It’s curious that he spends as much time as he does raging about Metro and Mayor Parker and Washington, DC (?!?) since the main driver of the BRT effort, as well as the earlier Uptown Line design, is the Uptown Management District. Management districts are government-created entities, and there are certainly issues about the powers being granted to these unelected bodies, but all that escapes Mack’s wrath. Second, Mack misses the point about bus service in the Galleria area. The idea here is to provide a dedicated right of way to the BRT buses, as is the case elsewhere with light rail and would be/would have been the case with the Uptown Line, so that they are not stuck in the awful traffic that currently snarls mobility in the region. A lot of people live and work in Uptown, and of course a lot of other people come into Uptown to shop or do business. Some number of the trips they take during the say is from one Uptown destination to another. Ideally, the Uptown BRT line would provide a viable alternative to them to driving from point A to point B, which in turn would help un-snarl things a little more. A BRT line could make such a trip quicker than driving, factoring in walking and waiting on the one hand and navigating a parking structure on the other. A bus line using the same streets as your car cannot. Third, remember that part of the Uptown plan includes tying the Uptown district into Metro’s park and ride system, which Mack never mentions in his jeremiad. While it’s not clear (at least to me) how this will be done, it should be obvious why this is a good thing. Having the BRT line in place so that one isn’t stranded during the say will make using the park and ride service that much more attractive. Add bike sharing to the mix, and you can make non-car transit into and out of the Uptown area, and around it for those who live there, viable in a way that it just isn’t right now. How can this not help with mobility? Finally, and not to put too fine a point on it, the voters did approve the Metro 2012 Solutions plan, which included a light rail line in Uptown, back in 2003. We’re not going to get exactly that with the Uptown BRT line, though we may yet someday, but as is so often the case with opposition to this and to the University Line, those expressing that opposition simply ignore that electoral result. This is the vision people voted for. For a variety of reasons, some of which can be blamed on Metro and some of which cannot, that vision still isn’t and may never be completely fulfilled. But that vote mattered, and the default direction should towards its fulfillment, not away from it. 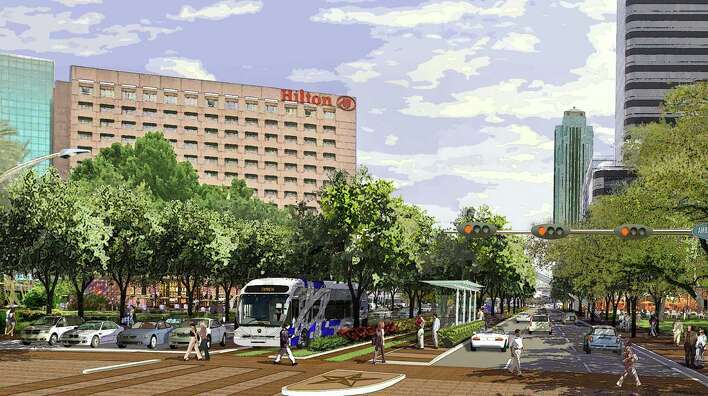 The driving force of a project that Uptown Houston District has proposed to the city to transform Post Oak Blvd.? Big beautiful buses. With both residential and commercial developments like Skanska’s 20-story office building popping up along the major transit corridor and METRO’s Uptown/Gold Line nowhere in sight, the District has developed a $177-million project featuring light rail-like BRT to update Post Oak — a street “that has long outlived its original use,” says John Breeding, the District’s president. In the next 2 years, almost 3,000 residential units will be added, says Breeding. Congestion can be so bad that even off-duty traffic cops can’t ease it. Though METRO has plans for the Uptown/Gold Line, Breeding says that that could take up to 20 years. Instead, the District sees BRT as a solution. I interviewed John Breeding in 2010, and the future of transit in Uptown was a major part of the discussion. At the time, he thought that the Uptown Line was ten or fifteen years away, so the 20-year time frame mentioned above isn’t that far off from that. The key to this is that the proposed BRT line would have its own dedicated right of way. If you’ve driven along Post Oak any time ever you know what a difference maker that will be. The Uptown District has had a plan for this for a long time, and if light rail is farther away on the horizon, this will do nicely as a substitute, possibly a placeholder for rail in the future. Tying Uptown into the park and ride system is also part of this plan. It’s a bit less clear how that will work, but the idea is simply that you need to be able to get people into Uptown without their cars in addition to giving them a way to move around Uptown without cars. Sure would be nice to have the University Line available for that, too, wouldn’t it? I hope all those Uptown business interests that have put so much thought into their vision are reminding John Culberson about that. We’ll see how long it takes to put this part of the plan into action. Metro officials realize improvements are needed, [Board Chair Gilbert] Garcia said. That’s why they back Uptown’s plan. Uptown Houston, which derives most of its funding from the tax increment reinvestment zone funded by property taxes in the zone, will pay between $82.5 million and $91.6 million, Breeding said. The rest would come from $24 million in state transportation funds, and a $45 million grant from the Houston-Galveston Area Council, using federal money the region received. Garcia said Metro, which approved the idea in September, will continue to support Uptown as it waits for a decision by H-GAC, expected in about 30 days. If progress goes as expected, Breeding said, buses could start running in 2017. Uptown’s plans enable Metro to adjust its own priorities, Garcia said. After years focused on building the three rail lines set to open next year, Garcia said, the agency can be more nimble at fixing gaps in service. The flexibility is built into the Post Oak plans, where trains could one day replace the buses. But in the interim, Garcia said, if buses do the job perhaps Metro can use its resources elsewhere. That includes the long-discussed east-west University Line. After the East, North and Southeast lines open, and Uptown gets its bus lanes, the University Line remains the one major unfinished light rail line. It also lies between the downtown rail expansion and the Uptown progress. “The natural (thing) will be that people will start wondering how we connect the two,” Garcia said. The conventional wisdom has always been that the Uptown Line, which was always going to be built with local funds, could not be built without the University Line. Doing Uptown as BRT, at least for now, flips this on its head. It’s possible that the existence of an Uptown BRT line could become a catalyst for getting the University Line built. Wouldn’t that be something? This is not the sort of thing I want to see. The difference between building the two U lines and not building them is the difference between having a fully functional rail transit system and having a few light rail lines. Among other things, the various commuter rail lines that are being talked about will be far less useful if you can’t continue riding rail into places like Greenway Plaza and the Galleria. The University line is the linchpin, as David Crossley put it, and not having it would leave a gaping hole. Having said all that, it’s a little early to panic. The University line is an excellent bet to receive federal funds, which will help a lot. If you listened to my interview with John Breeding of the Uptown Management District, he believed the Uptown Line was at least five years away, perhaps more like ten, and it’s likely that the financial picture will be quite different by then. And of course there’s the matter of the 2003 referendum, in which the voters approved building these lines. You’d think there will be some pressure to finish the job. Responding to Parker’s comments, [Metro Board Chair David] Wolff said he believed the agency’s funding plan is feasible, although he was happy to discuss the matter further with the mayor. Metro confirmed this week that it intends to issue $2.6 billion in bonds in the next few years, about four times the amount of debt approved by voters in 2003, to finance its rail plans. The agency said voter approval of the bonds is not necessary. Wolff said Metro will be able to pay down the bonds it will have to issue for the University and Uptown lines and remains confident that the remaining puzzle piece — an additional $700 million in federal funding — will be approved by the Federal Transit Administration. The bond question was the subject of a story from yesterday in which we get the usual treatment of someone who is not a rail supporter trying to tell the rest of us what the referendum really said. I’ll simply note here that that point was not addressed by Mayor Parker and leave it at that until we see what the transition team has to say. So now you know. Tomorrow I will publish an interview with soon-to-be-outgoing Metro Chair David Wolff. Tune in then and hear what he has to say.